Record-breaking crowd at Lakewood library! Aladdin the Egyptian Uromastyx lizard WOWED the crowd at an elementary school! Outback Ray's Amazing Animal Show is fun, exciting and very educational. This hands on show is extremely entertaining for kids of ALL ages. Every show is personally customized to meet your needs for ANY event such as Birthday parties, schools, camps, picnics, day cares, and holiday parties. Outback Ray brings 10 to 15 captive born, exotic animals to your show. They are trained and handled daily to ensure the safety of the audience as well as the animal. The show averages 45 minutes to 1 hour in length, but can easily be extended to fit your event. His hours are flexible, 7 days a week, all year round.The show can be done either indoors or outdoors, weather permitting. What a great program to book for any event. Ray was funny, engaging, educational, and overall a wonderful hire for our Library. Even days later, families are still reaching out to me with large amounts of praise for how great Outback Ray's show was. The fact that the audience was welcomed to come and and pet each animal was a huge PLUS for the show as well. Great job! Thanks Outback Ray. I have seen many animal shows and none of them come close to how amazing outback ray is! He not only has an amazing selection of animals, but is also patient and humorous with both the kids and adults. If your planing on an animal adventure out back ray is the only one worth your time! Wow! Thank you Leann for this 5 star review!! I’m so glad everyone enjoyed the show!! Very cool animals! Great interaction with the audience! He really took the time to explain each animal and take them around so everyone was able to touch the animals. Highly recommend Outback Ray! Thank you so much Emmaly! I really appreciate the great review and I’m hsppy you enjoyed the show! Great Show and My Kids LOVED it! I took my children to see Outback Ray's show this afternoon and they absolutely LOVED it! Ray does an amazing job and he is truly passionate about what he does. I cannot say enough about how much we enjoyed Outback Ray's show! We look forward to seeing him again soon! Thanks Audrey for such a great review! I’m glad you guys enjoyed the show! Ray's life long passion for his animals is really apparent. Loved his presentation he was able to teach the kids something about all these wonderful animals while holding their attention with a great sense of humor. I hired him for a Cub Scout Pack Meeting and the kids and parents loved it. Thank you for the 5 star review! It was a great part, I'm glad everyone had such a great time!! Outback Ray was above and beyond the best entertainment we could have asked for at my four year old daughter's birthday party! We had seen him at a few other events over the past couple years. He is what my daughter requested for her big day, and she often pretended to be him at home prior to this party. Not only did he have so much great knowledge to share with us, and extremely wonderful animal handling skills, but he was also amazing with everyone there! He had great charisma with adults and children alike! The animals he brought were extremely reflective of the type of love and care he gives them. They were all so friendly and beautiful to look at and hold! I cannot say enough of how much we enjoyed Outback Ray! He was an absolute pleasure to work with and I truly hope we get to work with him again! Thank you so much Megan for such a great review! I really enjoyed The party, such great kids and keely was a wonderful helper! Thanks again and hope to see you guys again in the future!! We've used Outback Ray for over a year at our business, Cafe O'Play in Stow OH. Ray does a great job of entertaining kids and informing them about the animals he has brought to show them. During our busier winter months we have Outback Ray in almost every week and he has enough animals to have unique shows each week of the month. My customers have greatly enjoyed having him at our business. Thanks so much John! I always love coming to café o play, you have such a great crowd and we have a lot of fun. Thanks for always inviting me back! Our school love Outback Ray! Really easy to book. The kids & parents enjoyed the show! Loved the many audience interactions! We will use again! Thank you so much for the great review! I look forward to seeing you again soon! Outback Ray was just at my daughter's 8 year old birthday party. She is about as girly girl as you can get, but totally loved this show. You can tell that Outback Ray was an expert in what he does, and he captivated an entire room of kids of all ages. He was funny, sweet, and made my daughter feel special. Thank you for making her birthday party so great! I'm so glad she and everyone else enjoyed the show!! We had a great time! Thanks for the awesome review! You guys were great! Outback Ray did a fantastic presentation at our school! His sensitive interaction with our students was fabulous! His wealth of knowledge about the animals, sprinkled with humor and gentle teasing was very entertaining. He shared from his life experiences about how his passion for animals encouraged him to be a better student, and he encouraged our students to find their passion. Thank you Lori, for this great review! I'm glad you guys enjoyed the show, I look forward to doing it again soon! For our son's tenth birthday party, we told him he could do anything that he wanted. He was quick to choose Outback Ray! We have seen many of Outback Ray's shows in public places, with big groups, and we have always loved his shows, but this was our first experience at a private party (and in our house!). Every aspect of our experience was awesome. It was super easy to book the party and Outback Ray was quick to answer any questions I had as we were planning. He was there right on time and set up in no time. From the time he began the show (with our group of about 30 kids ranging in age from 3-11), the whole group was captivated--even the parents who stuck around to watch! When I looked back at the pictures I took during the show, I noticed that there was not a child there who wasn't smiling (or watching the show in awe!). Outback Ray obviously loves what he does and is so great at it! He knows how to interact with kids of any age and made them all feel like a part of the show, especially the birthday boy, who got to pet and hold all of the animals. He was in heaven, and quickly confirmed that this was the best birthday ever! I have nothing but praise for Outback Ray. His price was extremely reasonable, especially when I compared it with what I would have paid to have a birthday party for my son at some other location with the number of friends he invited. His show was outstanding, and he was a pleasure to work with! I would recommend him to anyone planning a party or event for children--he really is the best choice! WOW! Thanks so much Rebecca for this incredible review. I really appreciate everything you said! I look forward to seeing you guys again in the future! Everything we could ask for, and more! We have hired Outback Ray every year since at least 2009. We host a 'special needs' night at our church with almost one hundred participants, and Ray is always a hit. The animals are great, and every kid (and adult) can pet the animals if they want to. We are always excited when we know that the entertainer that night is Outback Ray! Thanks so much for a great review Chuck! You guys are great! I look forward to doing your show every year!! Outback Ray loves what he does and it shows! Outback Ray was amazing for my son's preschool birthday party. He was wonderfully engaging for both the young children and the grown ups. Ray brought a large variety of unique animals and reptiles, but of course the star was SpongeBob the snake!! Ray is very knowledgeable and every show I have ever seen him at I learn something new. His follow up before, during and after was impeccable! He was such a pleasure. Thank you Outback Ray!! Thank you Juli for such a great review! Your feedback is much appreciated! I'm so glad everyone had a great time! I highly recommend Outback Ray for any party for all ages! The show was entertaining, educational and full of laughs! He is great with animals and children! It was non stop fun! Thanks so much for this great review! This was a great show and a lot of fun! It was a pleasure! A Birthday to Forever Remember! Just such a great experience! He handled a gaggle of kids with humor and kindness. The show is SUPER fun, hands-on and educational! Definitely a party my son will never forget! The other kids and parents said it was great, too! Worth EVERY penny! I saw his show and everyone had a great time. I will call for my daughters birthday party for sure. He has great animals and was great with them and all the kids too. My 8 year old son and his friends loved the interactive show by Outback Ray. Excellent! Thank you so much for the great review! The show was a blast and the kids were so well behaved! Nursing Home Residents LOVED it!! We recently had Outback Ray come to the nursing home that I work at. He and is friends were such a hit! Our residents got to enjoy something different other than our regular Bingo game or Hangman! 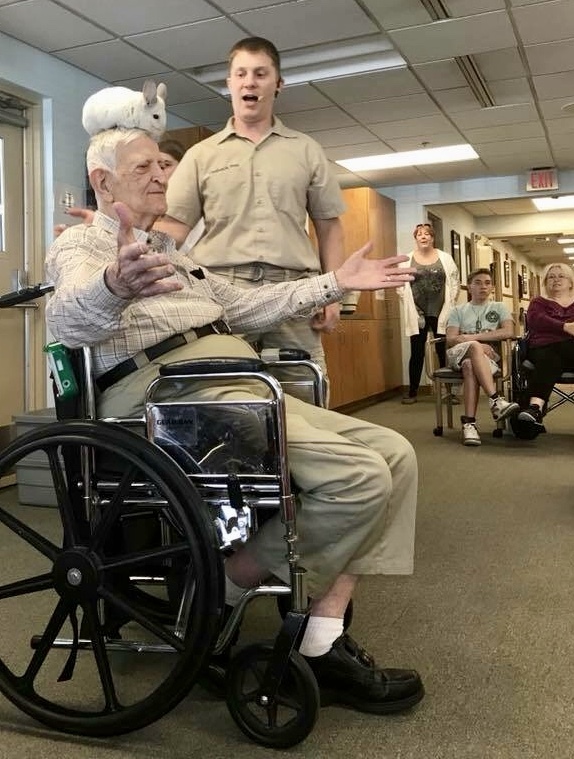 Ray did a terrific job keeping our residents engaged, making them laugh and allowing them to touch the animals. He was very entertaining and his animals were amazing! This is the second time we had him come and we will definitely be using him again. He did a great job in making our residents smile, which for a few of them, smiles are far and few in between! Thank you Outback Ray!!! Thank you so much Ashley for this review! I had a great time at your facility and I look forward to returning! We had a party for 4 year old twins, there were about 40 kids most were under 5!!! Outback Ray had everyone's attention the entire time. The kids all behaved and loved all the animals, plus everyone got to participate and pet every animal. Outback Ray was great and I would definately recommend him for any event! Thanks Rick for the 5 star review!! It was awesome seeing you guys! I had great time! We will have him every year! We have had Outback Ray come to our school ministry for several years. The teachers always compliment him on the way he relates to kids and adults alike. He brings a variety of animals each time so children who are with us for consecutive years see different animals. He's kind and entertaining to all ages. We enjoyed the facts he shared about each animal and their original habitats and so forth. If you have a chance to bring him for an event your involved in, you should! Thanks guys so much for the review!! I love going the Fairlawn Lutheran each year! You guys are wonderful! Outback Ray Rocked Our First Graders World! What a wonderful educational and exciting experience for our first graders. Outback Ray came to our school at the end of January and our kids are still talking about the program and the animals! Not only was Outback Ray extremely informative, he was also so entertaining. 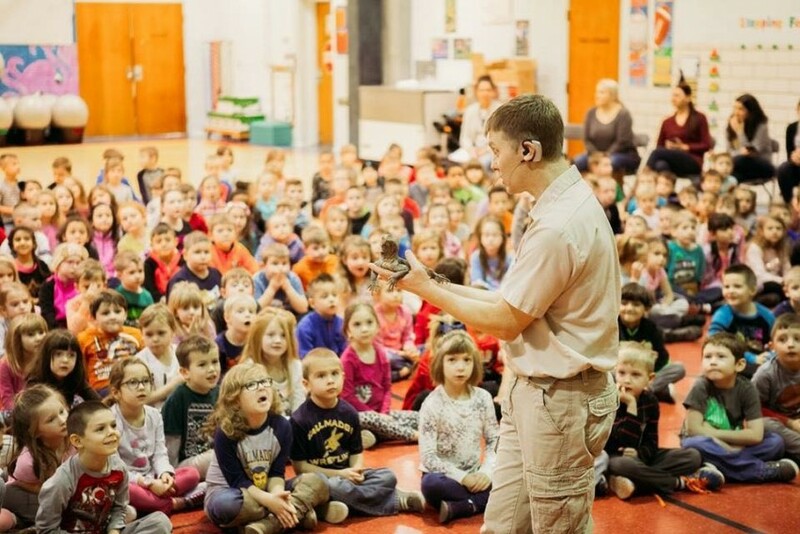 He captivated our students, kept them fully engaged and made them laugh while they learned about the characteristics and habitats of various exotic animals. He had a great personality and interacted with the students beautifully. I would highly recommend OutBack Ray and look forward to having him return next year! The other three first grade teachers feel exactly the same way! Thank you so much for such an amazing review!! I had such a great time with the 1st graders, they were such a great group of kids! I look forward to coming back next year! I am 100% an Outback Ray fan! We've seen him many times at public events and have had him for our own parties as well. He is AMAZING with children and you can tell his animals are very well loved and cared for. Not only are the children entertained throughout his entire show but the adults can't get enough! He has our whole party zoned in on his awesome performance. I have seen others and no one else compares! Outback Ray is the real deal. Genuine, knowledgeable and a true animal lover. If you want an amazing party, Outback Ray is the one to call! Thanks Beth for your review! I really appreciate all the great things you said. I'm glad you have enjoyed my shows in the past, and I look forward to seeing you in the future! My daughter loves animals, so we wanted a party to highlight animals. She saw him twice in the community and was so excited to have him come to the house. We had 19 kids with age range from 3 to 11. Everyone from the youngest to the adults were laughing the entire time. My cheeks actually hurt from laughing by the time he left. Everychild felt involved and the birthday girl felt special. It was the best birthday party yet and a big part of the success was due to Outback Ray. He is knowledgeable and fantastic with kids. Thank you so much Lindsay for your review! I love to hear things like this! Glad you guys enjoyed the show, it was a blast! Outback Ray puts on a weekly show at Amazone Family Entertainment Center and he is our most popular event every week. His animal show is always exciting and fresh, and the kids love the animals he brings. They learn about the animals and get to actually interact and touch them, enhancing their experience. With his large menagerie, there is always a different variety every week. Outback Ray's knowledge of animals, his care in the animals' health and happiness, and his camaraderie with children have made him the most popular animal show in Northeast Ohio. Amazone and our customers love Outback Ray and his Amazing Animal Show! Robin, thank you so much! I appreciate your kind words! I have enjoyed performing at Amazone for many years, and my girls absolutely love coming when they can to experience all Amazone Family Entertainment Center has to offer! You have a wonderful facility and I'm happy to be a part of it! OUTSTANDING! Second year in a row! difficult at all! He gives tidbits of facts about each animal and he intertwines 'funny' with the show! He is wonderful with kids and answers questions after show about animals. His prices are easy on pocket book compared to others doing the same thing....they're not as good as rays show though! He has also helped me with setting up a habitat for leopard geckos we keep as pets and educationally for my childcare science program. ThanksRay! Thank you so much Sandra for such a great review! I look forward to your picnic every year! I'm so glad the geckos are working out, I knew they would! See you next year!! Ray is a perennial favorite! Ray always entertains and educates the kids who come to our library programs! He's one of the first performers we book each year. Thanks Jo for the 5 star rating! I enjoy doing the Youngstown libraries every year! It always a pleasure. Outback Ray is entertaining and educational! We've been enjoying Outback Ray shows for years at Playmatters Toys! He's professional and reliable. His show is very entertaining and he always attracts a crowd when he makes appearances at our stores. Kids and parents enjoy his show - it's appropriate for all ages. Plus, kids (and adults!) will learn about animals from his show. He's patient with children and practices safe handling with the animals. If you're looking for a captivating, interactive entertainer, I highly recommend Outback Ray. We celebrated my daughters 5th bday. She had been waiting to turn 5 since she was 3 so we wanted to make the day extra special. We had a carnival themed party. Outback ray was awesome with kids. My one year old sat through the entire show completely amazed. Riley, the birthday girl, was so fascinated with the animals. After party was over she lined up her baby dolls and put on a show for them with her stuffed animals. We asked if she was outback riley now. She said no I'm outback ray. Thanks for making the big 5 a special memory. Thank you so much Daisy for such a great review, I love that Riley was "Outback Ray", how cute! I'm glad I was able to be a part of her big day! Outback Ray is the best Animal entertainer out there! I have had him come to summer camps and various daycare settings and he always puts on a great show! What I love the most about him is that he truly loves, respects, and cares for his animals! He is age-appropriate for any audience! He is very informative too! Ray gives each child a chance to pet or view the animals. He really takes his time with the animals and the kids!! HIGHLY RECOMMEND!! Very dependable! A complete hit for my animal loving family! Outback Ray's show was a hit with all three of my children ranging in age from four to eight! It's been a month since we saw him and my son still talks about Sponge Bob! Five stars!!!! Can't wait to see him again! Thanks so much Jeannie for the great review and compliment! I look forward to seeing you guys again in January! 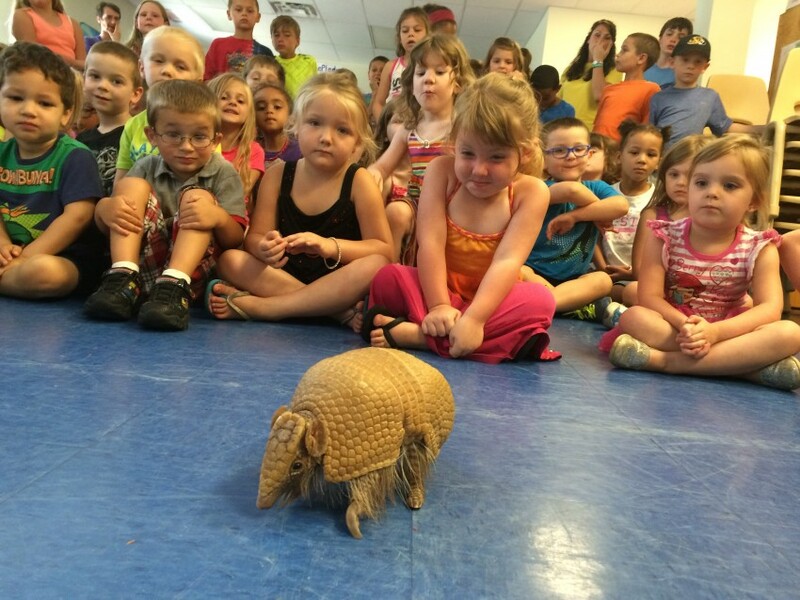 A kid-friendly, educationally amazing animal show!! 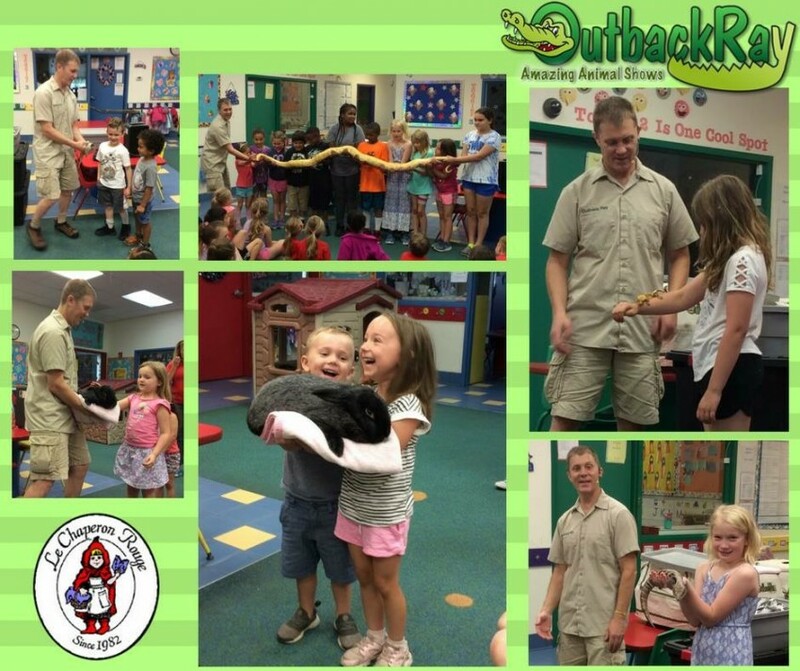 Outback Ray has been providing his amazing animal show at our childcare facility for many years now! Our children look forward to it every summer, as part of our camp program. Our toddlers, preschoolers, & school-agers all attend and have a blast! Outback Ray is reasonably priced, flexible & always ready to adapt.to any circumstances! On another note - I recently attended a fundraiser for a friend who's child died with cancer. This fundraiser was to benefit the study of childhood cancers, a devastating disease. As usual, his show was fabulous! I was so impressed to hear later that Outback Ray waived his fee for that show and donated that amount back to the fundraiser for the cause. Thank you so much for this review. I enjoy performing at the Wonder Years child care every year. And for the fundraiser, it was the least I could do for such a cause. Thanks again, I appreciate your feedback. I have seen Outback Ray several times in my professional and personal life. I can tell you that you will never see the same show twice. The variety of animals and level of audience interaction with the show is a pleasure to watch. Outback Ray reaches out to young and old, holds true not only to showmanship and entertainment but also educating his group. I have booked several shows for our elderly patients and there's nothing like seeing a 90 year old woman allow a snake to be wrapped around her neck! I have also seen Outback Ray with children's audiences and the pure energy with which he can entertain and keep wandering attention spans is amazing. Our family reunion last year had over 300 members, 75% of them children, who sat and listened intently to stories of their favorite animals. I've seen both the younger and older generations ask questions and raise hands to be "brave volunteers", just hoping that they will get that chance to play zookeeper. My kids still tell everyone about getting "whisker kisses" from a chinchilla, having a cockroach on their bellies, and touching a snake larger than them! Thanks for all you do! Can't wait to continue working with you in the future. Wow, I dont know what to say! Thank you for posting such an awesome review. Its great to hear such positive feedback from someone who has seen my show from many different standpoints. Its always a pleasure working with you, it was great seeing you again! 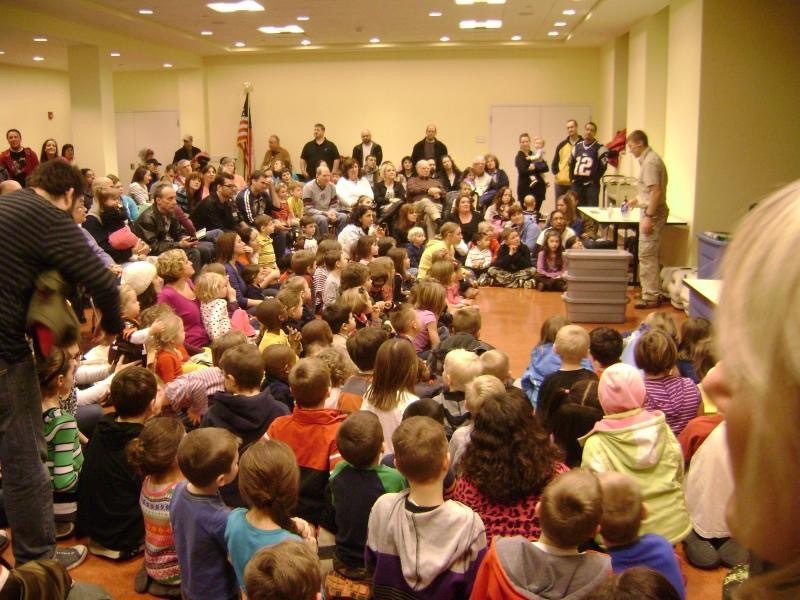 My 3 kids ages 5-9 went to see Outback Ray at the Ellet Library and it was a blast. The fact that we all got a chance to participate in demonstrations (including me!) was great as well as the plethora of different animals! I would totally recommend anyone who gets a chance to see Outback Ray. He was better and funnier I thought than some guys I've seen on late night talk shows. Great show!!! Thanks for the great review and compliments! SO happy to hear you and your family enjoyed the show! Great show..kids had a blast...our favorite animals were Gabby and Zombie...can't wait to see the next one!!!! I'm so glad you enjoyed the show Tracy! See you next time!! As a children's librarian it can be very difficult to find high quality children's entertainment and staying within a rigid budget. Ray satisfies both of these criteria. He is AWESOME and packs the house year after year. I normally do not book the same entertainer for at least 3 or 4 years, but I've had Ray back 3 years in a row. He is the first program to fill up in my busy library system. You will not be disappointed if you choose Ray! He is a total crowd pleaser. He's very friendly and knowledgeable and makes sure that every child that wants to can participate. Rock the Docks Loves Outback Ray! One of the highlights of our local festival every year is Outback Ray. He performs two shows for us and is as informative as he is entertaining. The kids are delighted an opportunity to touch and hold many of the animals and Ray has a real knack for engaging them. Thanks Cindy for the great review! I look forward to Rock the Docks every year! See you very soon!! I have used Outback Ray for two festivals and a holiday party and he is great. The show draws not only children but people of all ages. the show is very entertaining but educational. We booked Outback Ray for my daughter's 5th birthday party and he put on a fantastic show! All of the guests were raving about the show! The children were all captivated and wanted to touch and learn about each animal. Not only was the show educational, it was also very interactive and fun. Outback Ray has a great vibe that makes you want to see what he's going to do next. So many adults asked us how they can reserve him for a party. We loved the show and thought it was a great quality for the price. Outback Ray himself was very personable and he felt like one of our long time friends. We can't wait to see him again at one of our friend's events. And, we may just have to book him again for my son's party! Definitely a 5 star performance. And in the words of my daughter - it was the BEST birthday ever because Outback Ray was here!!! Aw! I'm so glad I was able to be a part of Kayla's 5th birthday party! It was a great time and you guys were awesome! Thanks so much for the great review, I really appreciate it! Outback Ray visited Willard Memorial Library in Willard, OH on July 1st as part of our Summer Reading program. The audience from young to old were captivated! Not only did he bring unique animals, but his performance was laced with little known facts about the animals, and tons of humor. His show was entertaining from beginning to end. I have not had a show that was better for getting the audience to talk to each other. I saw many groups leaving together who did not show up together; chit-chatting about the performance and their favorites! I for one will be booking Outback Ray again! Thanks so much Charlotte for this amazing review! Its great to hear such positive feedback, not only about the show but about the audience after the show as well! I appreciate you taking the time to post. Outback Ray was wonderful to the kids and had great animals. He came to my sons birthday party with wonderful animals. All the kids and adults loved the show. He was professional, kind and answered all the questions about the animals. I highly recommend him. the show was a big hit not only with my children but every child in the room. I plan on booking an event with outback ray soon . . .
Outback ray is very enthusiastic and fun to watch! The whole crowd gets involved and if you like the idea, you can at time be a part of the show! Overall it was a great experience and I would recommend to anyone looking to see animals or reptiles you would never see up close and personal! OUTBACK RAY'S PERFORMANCE IS THE MOST STRUCTURED, PROFESSIONAL, EDUCATIONAL,ENTERTAINING "TALENT" SHOW I'VE SEEN. HE'S THE TOTAL PACKAGE. I was very impressed with Outback Ray. He was very educational but also entertaining. I also noticed our well he interacted with the kids! He was kind and patient but also he wasn't afraid to correct them. Awesome Show both Entertaining and Educational!! We have see Outback Ray's show a couple of times and he is fantastic!! He is great with the children both by entertaining them and educating them about the animals as well. He is an amazing presenter which is relevant on all the children's faces and the adults too. He takes great care of all his animals. He makes sure that none of his animals are stressed or mishandled all the while maintaining complete control. He loves what he does and it shows. I would recommend his show to anyone and everyone!! Outback Ray was great! We loved it. He had a variety of animals and made sure all the kids had a chance to participate. We have had him @ our preschool for 3 or 4 years now and he always puts on a great show! The kids love him and all the different animals he brings. He does a fantastic job interacting with the kids and is so patient with the children who are a little afraid. I love the fact that he keeps track of the animals he brings from year to year so he can bring ones we haven't seen before! Very knowledgeable about all the animals. Packed, non-stop entertainment which kept kids and adults on the edges of their seats. Everyone leaves having learned something new and more in awe of the world around us. Very Entertaining and Educational!!! Loved it! We saw the show at our neighborhood library. Outback Ray is very entertaining! He makes sure to include all children, and makes it fun for all in attendance - young and old(er)! We even learned some things! His show would be great for birthday parties, reunions, company picnics, etc.! Outback Ray clearly loves what he does!! He is so good with the children and handles the animals with such ease!! Everyone love his shows and as an Amazone worker we hear great things!!! I've watched the show several times and he always brings in different animals and wows the audience. Outback Ray recently brought his Amazing Animal Show to our facility and it was a huge success. He brought a variety of exotic animals and gave concise and informative descriptions for each one. We had a large family crowd and he included a lot of audience participation along with a little humor. Outback Ray's Amazing Animal Show is first rate family entertainment! Thank you Mary for such a nice review! I'm happy everyone enjoyed my company as much as I enjoyed theirs! Thanks again for the compliment! We have hired Outback Ray for many years now and he never disappoints! All of the campers just love him and his show. He is very informative, and entertaing. His animals are always great and he tries to bring something new every time. We have peope come back year after year to see him! Excellent show. Best animal show ever! Ray is super knowledgeable about his animals and is a great entertainer! It's obvious how much he enjoys his job and how much he loves the animals! We have been to Outback Ray's Amazing Animal Show a number of times and have thoroughly enjoyed it every time!! The show is funny and educational...not only for kids, but adults too! They take great care of the animals. When you have a party he is on time and lives up to what he says he will do. We would recommend this show to anyone! We have seen his shows numerous times and each one is better than the one before. Outback Ray is funny, interesting, educational and just an amazing entertainer. The kids love him and so do the adults. His is by far the best animal show around. the animals were so cute and fun to see. he interacted well with his audience. I felt comfortable holding animals including snakes. it is a great thing to have at kids birthday parties. it's a wonderful experience and it's really awesome. I am 100% an Outback Ray fan! We've seen him many times at public events and have had him for our own parties as well. He is AMAZING with children and you can tell his animals are very well loved and cared for. Not only are the children entertained throughout his entire show but the adults can't get enough! He has our whole party zoned in on his awesome performance. I have seen others and no one else compares! Outback Ray is the real deal. Genuine, knowledgable and a true animal lover. If you want an amazing party, Outback Ray is the one to call! We were delighted to be entertained by Outback Ray and his animals while camping with our family. He is wonderful with the audience, always able to hold everyone's attention. He is very knowledgeable about all the animals and able to answer questions so the children understand. Not only is he educational, he is very funny and quite the entertainer. We look forward to seeing his show again in the future...Thank you Outback Ray for making our camping trip extra special. AN AWESOME SHOW FOR ALL AGES! WE TAKE THE GRANDCHILDREN TO SEE OUTBACK RAY EVERY TUESDAY AT THE AMAZONE. THE KIDS ARE ALWAYS EXCITED AND OUTBACK RAY ALWAYS HAS THEIR FULL ATTENTION. HE IS SO GOOD WITH CHILDREN AND WE HAVE LEARNED SO MUCH OVER THE PAST YEARS ABOUT HIS ANIMALS. I DEFINITELY REC AMEND HIS SHOW AS A MUST SEE!!! THE CHILDREN GO HOME AND PUT ON THEIR OWN OUTBACK RAY SHOWS WITH STUFFED ANIMALS. WE LOVE YOU OUTBACK RAY!!! Outback Ray’s show is EXCELLENT! I am also an animal presenter. My brother went to Ray’s show to check it out on my behalf. After watching Ray, my brother called me and told me how the audience was in the palm of Ray’s hand, as he articulately related about the animals and shared intriguing stories about his creatures. I left the house right away and headed over to the show to check it out for myself. This guy was amazing. I am VERY critical of animal presenters. I distinctly know the difference between a person with animals, a real orator who enraptures the audience. This man had “IT.” I loved the way could passionately communicate about the animal, while monitoring the animals behavior/stress level, and encouraging the audience to interact with each critter. He’s golden, AND he has the interpersonal skills and reliability to back-up his “act.” Outback Ray knows how to make the animals shine, and the glow reflects on the faces of each audience member. Outback Ray's Amazing Animal Show is 5 Star entertainment and beyond!!!!! He makes all ages from young babies to adults feel apart of his amazing educational, interactive show! The greatest animal entertainment by far! I highly recomend him for any company picnic, birthday party or event your hosting! He's super outgoing, great with all ages, family oriented and packed with enlightening information about animals!!! Thank you Outback Ray for doing an Outstanding Show for my Son Patrick's 1st Birthday Party! Your Amazing!!!! I will recomend you to all friends, friends of friends, strangers and family! I have seen Outback Ray do several birthday parties that my children have been invited to. We always enjoy his show. He's knowledgeable, funny and patient with the kids. The favorite part by everyone (parents included) is getting to touch some pretty unusual creatures! He loves what he does and it shows! This wonderful gentleman has been doing his animal show since both of my daughters were toddlers.Now 7 and 9, they still request Ray come out and do their birthdays.Not only is his presentation of the animals wildly entertaining, it is also very educational for the kids who get to interact and learn about each animal. I have recommende him to my friends and many have hired him for their kids birthdays with the same opinion, wonderful experience for the kids, and the adults! Animal Entertainment in Cleveland, Ohio. Outback Ray has been doing animal shows since 1987 and is fully licensed and insured. He has had a passion for animals since he was a child. He has appeared on television, trained animals for commercials and done reptile shows at the Cleveland Zoo. Not only does he do shows, he also breeds, trains and studies exotic animals. Through his show, Outback Ray shares his knowledge and the passion he has for exotic animals with his audience. He captivates you with his unique "family", all while sharing fascinating facts about each one. Learning will be fun and exciting while you hold and cuddle with his amazing animals. All of Outback Ray's animals live in his home as pets and are given the greatest care possible. They are trained and handled daily to ensure the safety of the audience as well as the animals.